and you can read the complete stories of LHS clients, Lee and Jeremy, below. Tenant Support Worker Chris Thorpe (pictured above, left) describes how LHS set one vulnerable client along the road to an independent life. Lee came to Leatherhead Start following a lifetime of missed opportunities. He always tumbled through the net of support and was constantly forced to fall back on his own resources which, because of his learning difficulties, were very meagre. It shortly became apparent to us that we needed to start from his basic needs, beginning with a GP. He was swiftly referred to the local Asthma Clinic and diagnosed with Chronic Pulmonary Disease which, with the benefit of suitable medication was soon under control. His other, less pressing physical needs were duly addressed with prescription spectacles, intensive dental work and audiological treatment. We then sought the help of our Disability Learning Team who wasted no time in assessing this vulnerable man and signposting him to the Occupational Therapy Department where he attended two very useful workshops both run by a psychologist and team for managing safe relationships. This was very important to Lee as, in the past, he had been targeted by unscrupulous people who had emptied his bank account, forced him to pay for food and alcohol for them and threatened him with physical violence if he didn’t comply with their demands. The local police were also eager to mitigate the possible threats he could encounter and issued him with a Pegasus Card which would enable him to contact the police urgently by simply quoting a code number. It was obvious that if Lee were to take up a tenancy then he needed some elementary courses to smooth his path and these were put in place: Literacy, Numeracy, Cooking, General Lifeskills and Speech Therapy. All of the above honed the skills he would need for more independent living. 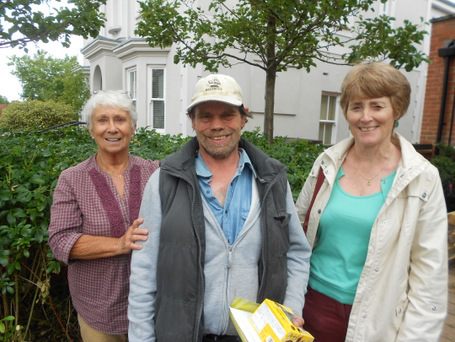 As soon as our Chair, Myfanwy (pictured above, right), a retired teacher, discovered that Tony was struggling to read, she devised a personal literacy programme for him and they met weekly during his stay. He also received cookery lessons from another volunteer. The one missing link for Lee was being both assessed and accepted by Adult Social Care and this, in the fullness of time, came to fruition. He was recognised as being a vulnerable man and budget and care plans were carefully evaluated specifically to meet his needs. A Social Worker was nominated for him and she worked tirelessly with great enthusiasm and empathy for this man who, for all his life, had tried and failed for reasons not of his choosing or his fault to embrace a ‘normal’ lifestyle. With the help of all the above agencies and, of course, Leatherhead Start he is now safely and happily ensconced in supported housing and no longer has to live in fear. By the end of 2014, Jeremy was at the end of his rope. In his early 40s, he had long suffered from depression, not helped by a growing dependence on the drugs he’d used for fun since his teens. He’d left school at 16. “I was lucky. It was a good family. My parents always said get a proper job,” he says. So he qualified as an electrician, but the work never inspired him. His personal chaos affected work and relationships. The longest job he had was the one or two years at Elmbridge council. “The drugs took over,” he says. He chose friends who were also users: “You could be up all night and not functioning the next day, so you couldn’t work.” He was happier when, for a time, he set up as ‘the Home Doctor’, but couldn’t face the self-promotion needed for self-employment. From time to time Jeremy would set up home with a girlfriend then go back to his parents: “My life collapsed on several occasions.” The youngest of three, Jeremy had always been close to his mother. But in September last year the family lost her to an inoperable brain tumour and Jeremy’s relationship with his father reached the point where he had to leave. For a time he lived on his married sister’s floor: “I outstayed my welcome,” Jeremy says. He ended up sleeping in his car. A few weeks after losing his mother he went to Mole Valley District Council’s Dorking offices to ask if they could find him somewhere to stay. A week later they found him a place at LeatherHead Start. Ever since he’d seen Jaws as a boy he’d thought how wonderful it would be to be a marine biologist. So he and Shirley looked for ways of doing it. Falmouth Marine School offered a two-year foundation course in marine biology that could be converted into a degree in a further year. It’s highly practical, covering not just diving instruction but boat management and repair. Not only that; it offered the personal development needed to become a marine biologist. And there was funding available: “I jumped at the chance,” he says. He jumped, as it happens, a little clumsily — he hadn’t sorted out his funding by the time he started attending lectures pending a student loan, he set off for the West Country: “I hadn’t applied for university before and I wasn’t sure what to do” — but by mid-November his finances had been sorted out. Also, he was granted interim funding from LHS, Bantam Charitable Trust and Leatherhead United Charites which kept him going until his loan came through. 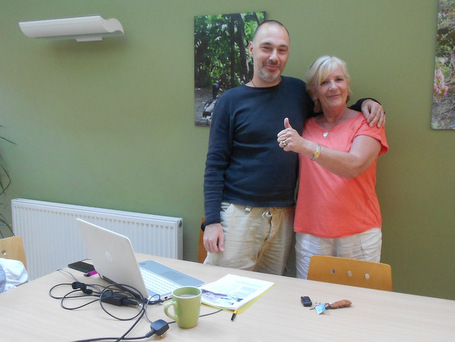 Pictured above: Jeremy with Shirley Steel just after he sent his application to Falmouth Marine College. Shirley is an Advisor for the ETHOS Project run by the Surrey Lifelong Learning Partnership and runs a Job Club at LeatherHead Start.